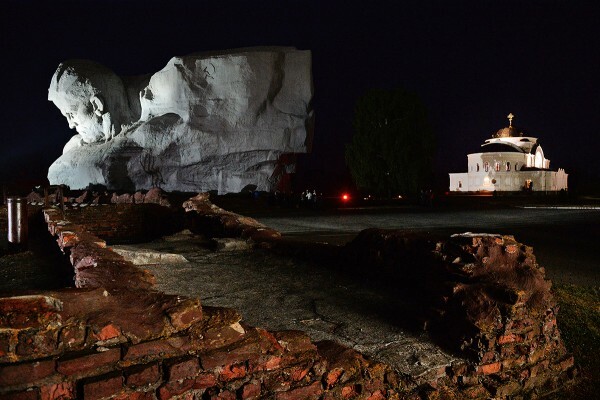 His Holiness Patriarch Kirill of Moscow and All Russia visited the ‘The Hero Brest Fortress’ in the night of June 21, which marks the 74th anniversary of the beginning of the Great Patriotic War. The Primate of the Russian Orthodox Church celebrated memorial service in commemoration of the defenders of the Brest Fortress and all those fallen in the Great Patriotic War. The service was celebrated at St. Nicholas Church, the historical garrison cathedral located in the fortress. Concelebrating were Metropolitan Pavel of Minsk and Zaslavl, Patriarchal Exarch of All Belarus; Metropolitan Hilarion of Volokolamsk, chairman of the Moscow Patriarchate’s Department for External Church Relations (DECR); Bishop Sergy of Solnechnogorsk, head of the Moscow Patriarchate’s Administrative Secretariat; archpriest Nikolai Balashov, DECR vice-chairman; and clergymen of the Byelorussian Exarchate, from Russia and Ukraine. Praying were also sisters of the St. Valentina of Minsk Sisterhood; military servicemen of the 38thlanding-force brigade of the Byelorussian Armed Forces; members of the St. Spyridon of Tremithus Brotherhood and of youth organizations of the Byelorussian Exarchate. After the musical-theatrical performance dedicated to the exploit of the defenders of the Fortress, His Holiness Patriarch Kirill and chairman A. Lis of the Brest regional executive committee, took part in the ceremonial laying of wreaths at the memorial to the heroes of the Brest Fortress. His Holiness and his suite had a tour of the fortress and departed for Moscow. They were seen off by Metropolitan Pavel, bishops of the Byelorussian Orthodox Church, Mr. Gulyako, and Mr. Lis. The Primate of the Russian Orthodox Church thanked the leadership of the Republic of Belarus, the Brest region, and bishops of the Byelorussian Exarchate for the organization of his visit.